Replacement: None. While we don't carry a direct replacement for this module, have a look at our other modules in the GPS category. This page is for reference only. 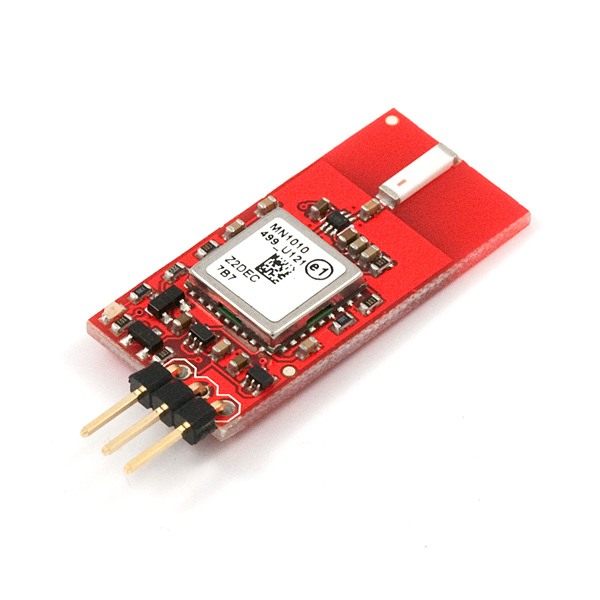 This miniature GPS module uses the compact GR10/MN1010 GPS module in conjunction with a GPS chip antenna and a SMA661AS 18dB LNA from ST Electronics. This board is about as simple as it gets, having only 3 connections: VCC, ground and a TX line. 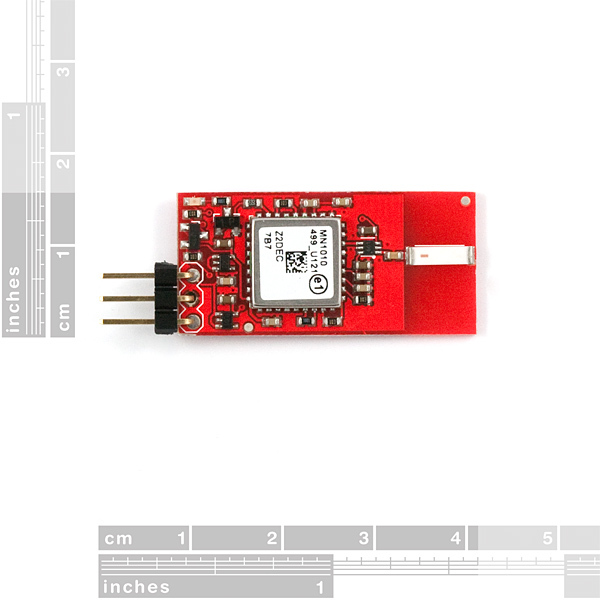 Power the board from a single 3.5V-6V source (ideal for single Lipo cell operation) and the unit will output NMEA serial sentences containing all the GPS data (location, satellites in view, altitude, time, speed, heading, etc). THIS UNIT WILL NOT WORK AT AN ALTITUDE OVER 18000 METERS (60000 FEET). This doesn't matter to most people, but is important to hobbyists that take part in high altitude weather ballooning, amateur rocketry, etc. Someone I know mistakenly purchased a unit with a similar limit for ballooning and I'm hoping to save people from making the same mistake. 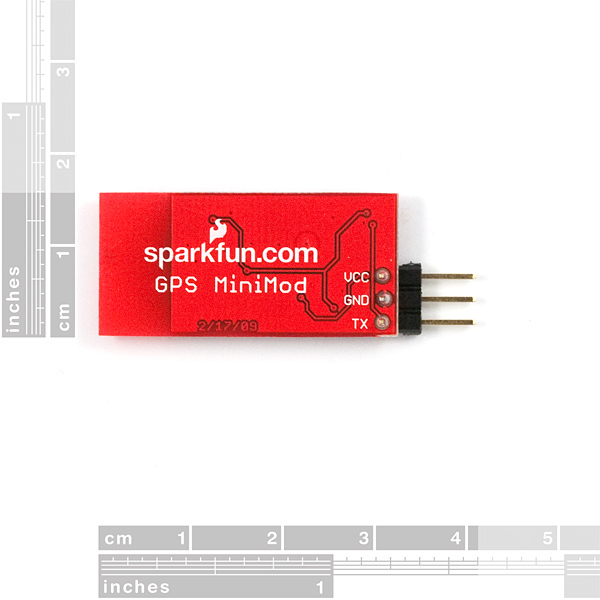 I'm going to post this in the comments section of all similarly limited Sparkfun GPS products in the hope of saving someone from from making the same mistake. I apologize if the Sparkfun guys consider this spamming, that isn't my intent. It, also, isn't my intent to drive business away from Sparkfun. They have an awesome collection of GPS products and many of the other modules don't have this limitation. If you are finding units that can exceed that limit be aware that these are not design flaws - they are International Arms Trading (ITARS) restrictions. If you find one in your "home area" and happen to cross borders you may be in for a surprise.
" (2) Designed for producing navigation results above 60,000 feet altitude and at 1,000 knots velocity or greater; "
I'm wondering the acuracy of location and speed of the module, and if they are not constant, which are the parameters that disturb them. I know this is 3 years old, but if anyone sees this, usually they will send dummy sentences until they acquire a fix on the satellites. If it keeps doing it for a long time, usually it means that the signal is too weak to get a fix. How often do these modules fire off updates? I need to know if the module need an command to start trasmission? Can I connect to a PIC without problems?? No commands required to start transmission, power it and watch those NMEA sentences at 4800 bps 8-N-1 fly. The Rx pin isn't broken out, so you can't talk to the module even if you want to. Shouldn't be any problems when interfacing with a PIC. I am just wondering are the messages that this unit outputs from its serial different to those of EM-406. And if so in what way? Can you please add the Eagle files? It would be great to embed it in other datalogging projects. No I think it means that it has a valid fix on satellite. what does the status of LED represent? I connected the minimod GPS but the LED it is not lighting. does that mean its not working? I have a nice piece of code running on the parallax propeller that receives all the data that I wanted to get except the $GPZDA data. Any ideas? I am using the unit in a static environment and perhaps it needs a dynamic environment to give this data? Any help is greatly appreciated. Is any example (best for arduino) available?! The baud rate and timing are all standard NMEA (4800,8,1,n). Example code...for parsing, I'm guessing? We've got a few examples around, I'll try to get something up shortly and I'll see if we have anything for Arduino. If you have any other questions, please email support@sparkfun.com and we'll try to hook you up a little better. Where do you get the Antenna amp from? I'm looking for getting a few less than that, like 2998 less, to be exact. Anyone know of a good replacement LNA that is more common? "Fully integrated GPS LNA IC"
Just wait for the MN5010 version, it is due very soon. Can this unit be used with BOB-00718 so that I can use it for GPS mouse? I really love the size of this unit but need a USB for my laptop. so close yet so far. any chance of a board rev that exposes RX and 1PPS? Hear hear!!! More function would be cool. How sensitive is this? Is it very effective indoors? Thanks. Take a look at making something like this based upon the SkyTraq Venus 634LP. It's as small as the GR10, does not require an external LNA, is a single chip [not a hybrid], allows logging to a serial flash connected directly to the 634LP chip, is cheaper than the GR10 [$8.50 in 1K] and performs as well as the SiRF based GR10. I forgot one very important feature, the Venus 634LP supports AGPS by providing 7 day ephemeris upload to the chip! Can you put up more info, like size and weight? (a schematic would be nice). Also could you use the MN5010HS? Size should be indicated in the ruler pics, weight...I'm not sure if we have anything that measures that small around here, but we'll see what we can do. Schematic is up (silly mistake, sorry about that). And we do have another breakout coming that uses the MN5010.